You don’t need a campfire to make these grilled caramel bacon s’mores…just fire up the barbecue and grill them up! The perfect salty/sweet treat. It’s that time of year again…S’mores season! Don’t you think S’mores are to summer what pumpkin is to fall? Or the ground-hog is to spring? Wait, what? Hear me out: when you start to see s’mores recipes popping up, you know it’s almost summer. And even though we’re thisclose to June 21, can we please call it summer already? Because the s’mores recipes are rampant, and I have another one for you! With bacon! That’s right, these are bacon s’mores! But not just any s’more recipe…a campfire-free s’more recipe. Because sometimes, you don’t want to drive all the way out into the mountains and build a campfire just to get your s’mores fix…with this recipe, any day can be a s’mores day! Why not make s’mores on the barbecue? I mean, it’s the perfect last-minute backyard barbecue snack! And because sometimes I like to get a little crazy with my desserts (come on, you know it), I threw on some bacon. And caramel sauce. And it was salty-sweet-gooey-melty-s’mores heaven. Assemble those s’mores and get to eating! There you have it, my fast and easy grilled s’mores recipe! Disclosure: This shop has been compensated by Collective Bias, Inc. and its advertiser. All opinions are mine alone. #LetsMakeSmores #CollectiveBias #sponsored Thanks for supporting the brands that support Sweet Peas & Saffron! You don't need a campfire to make these grilled caramel bacon s'mores...just fire up the barbecue and grill them up! The perfect salty/sweet treat. Line an old cookie sheet with aluminum foil. Arrange bacon on cookie sheet. Cook (with barbecue lid down) for 5 minutes per side or until cooked through. 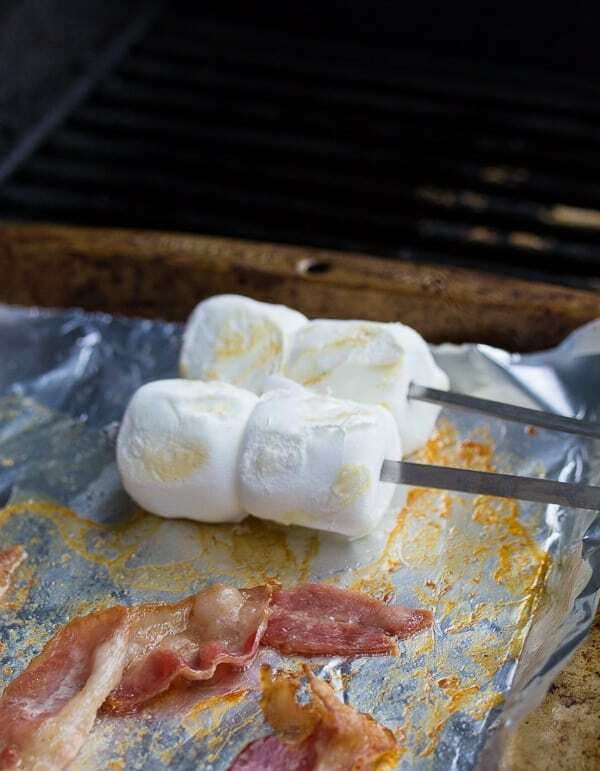 When bacon is nearly cooked through, place marshmallows on skewers and heat over barbecue. Don't place the marshmallows directly on the grill, but either hold them over the grill or place on the cookie sheet (as pictured). 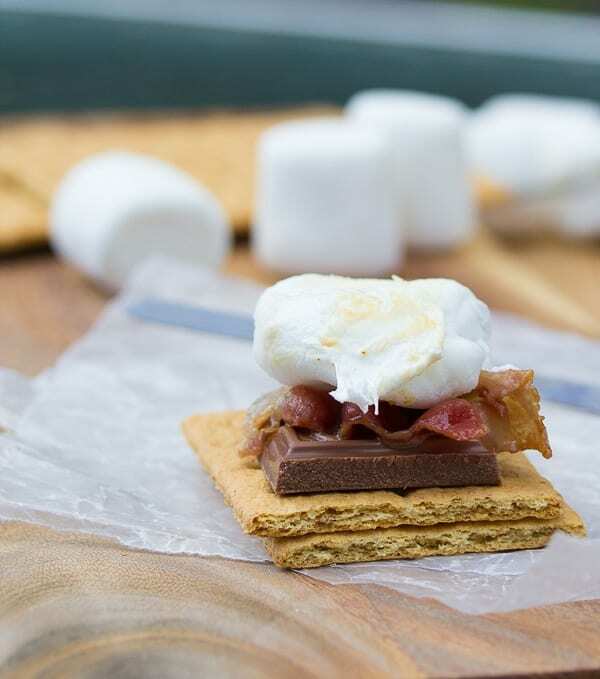 Cut the bacon into small, bite-sized pieces before assembling the s'mores. Assemble the s'mores:Place a square of chocolate over one half of the graham cracker square. 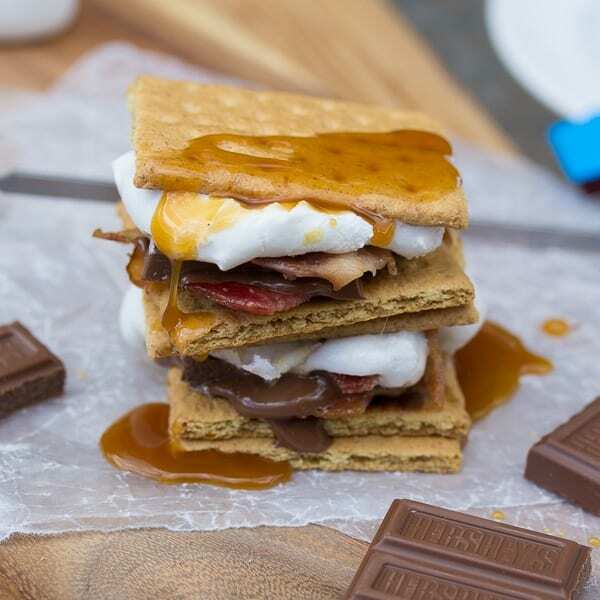 Place bacon over the chocolate, then a marshmallow and drizzle of caramel sauce. Top with second half of graham cracker square and serve immediately! I love all the hype bacon gets! This recipe is so different and the fact you can do it on the bbq is great! This might be our Father’s Day dessert!? Double WOW! These s’mores look amazing, Denise! Love the mix of sweet ‘n salty flavours! Yum – perfect summer food! Whoa! What a fun twist on a s’more! Love the sweet and salty thing from the bacon! 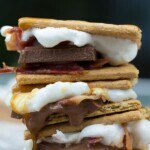 As a bacon lover, I know that once I’ve had bacon on s’mores, will never go back! This looks incredible! Sweet, salty, and golden brown! Who could refuse? My boyfriend and his friends would totally adore this recipe. So creative, Denise. Smores with bacon AND caramel? This is too good! And a great idea to make smores on the grill. We have so much dry grass on our ranch, no way I could make a campfire. I would burn the whole place down for sure, haha! Oh my god. These are sinful! Love the caramel, sweet/savory combo. This is my NEW favorite way to eat s’mores! Just WHOA. My jaw dropped reading this post! I am so making these. 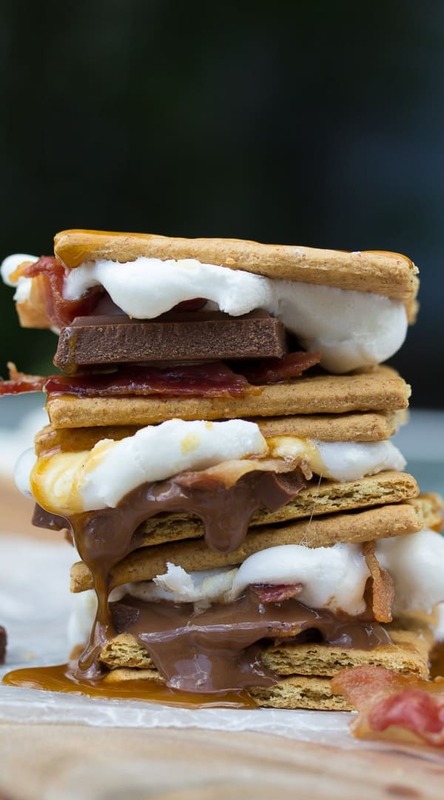 I mean s’mores with bacon, duh! Plus that dripping caramel is killing me! I am seriously drooling over that first picture… HOLY YUM!!! These smores look SO amazing, Denise! I mean, caramel, bacon, marshmallows and chocolate, you just can’t go wrong with that combination! It’s so creative and just calling my name! Delish! Oh thanks, Gayle 🙂 I think everything is better with bacon! Oh my goodness, these are just the ultimate smores combo, Denise! I love all the sweet ‘n’ salty flavors going on and I-totally-need-to-make-these-this-weekend-no-questions-asked. Gorgeous photos too, girl! Thanks so much, Sarah 🙂 I just love salty/sweet together, it’s my fave!